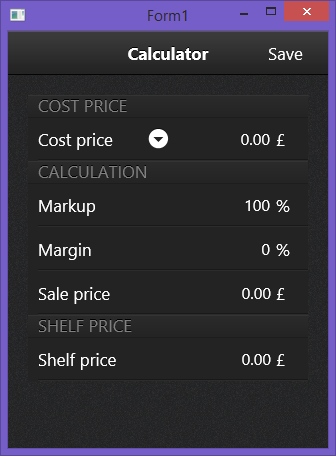 I’ve just finished uploading the styling section of the FireMonkey Guide. This section starts with an explanation of how the styling in FireMonkey works, how styles are created and then applied by FireMonkey. It then moves through how to set styles at run-time in your application and finishes up with a brief description of the built in style designer. As ever with the Guide I have attempted to distill out the essentials you need to know when using FireMonkey. 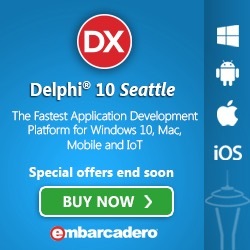 If, like me, you’re doing your Delphi iOS development on Windows then your probably making use of the compiler’s ability to compile and run your app on Win32. 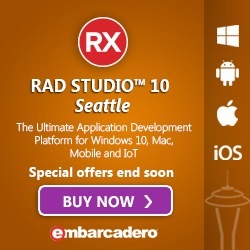 You’re probably also fed up with how dreadful your apps look during testing on Windows. Wouldn’t it be great if you could load the proper iOS styles on Windows? Sadly the true iOS styles are locked away somewhere within Delphi. But there are a couple of custom styles available for iOS and it’s a simple process to load them into your app. Start with your DPR file (select Project|View Source from the main menu). 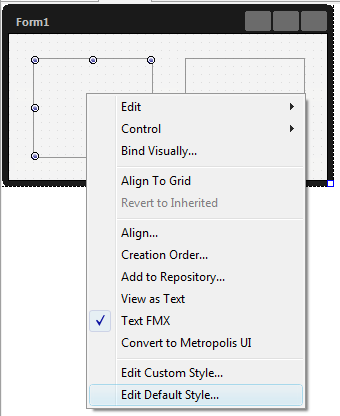 Add FMX.Styles to the uses list, and add the three lines shown below at the start of the code. The lines you need to add are the first three after the begin statement. The $IFDEF ensures that our code only compiles if Windows is the target. The line between loads the system style from the file specified (.fsf is a binary style file - you can also load .style files). The above code shows the default installation location for the files. In addition to the iOSBlack style named above there’s also an iOSTransparent file in the same folder. There are also two premium styles available for download from Embarcadero’s registered downloads area, with each style available in both iOS 7 and non-iOS 7 versions. The image below shows the iOS7Jet style running under Windows 8. Under the VCL, TTreeView has events OnExpanded, OnExpanding, OnCollapsing and OnCollapsed but there’s nothing similar in FireMonkey. TTreeViewItem has a number of methods which get called when the expanded state changes, but none of these is virtual, and therefore there’s no simple patch to add such support. However the IsExpanded property does change to reflect the state and since this is a trigger property is is possible to hack the styling and animation systems to add the support we need. Simply put we need to add an animation to the item, give it a duration of 0 (so it fires immediately) and hook into it’s OnFinish event so we know when the animation has run. It doesn’t matter which animation we use so I plumped for a TFloatAnimation, but it does need a valid PropertyName so I used Opacity and used a couple of near identical values so the change shouldn’t be noticed. There’s one slight fly in the ointment. 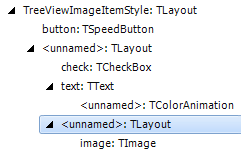 When IsExpanded changes the only animations run are those of the ‘button’ object from the style, so rather than adding the animation directly to the TTreeViewItem you need to add it to the ‘button’ item extracted from the style by FindStyleResource. So, we create a custom child of TTreeViewItem and add the above action to ApplyStyle. From there it’s simple to add a suitable event, OnChangeExpanded, and a method to call it. I’ve recently added a number of article about grids to the FireMonkey Guide. A couple of months ago somebody in the Embarcadero forums asked if there was a book FireMonkey. The short answer to that was no. Come to think of it the long answer was no too. There’s the Embarcadero DocWiki which lists every class, method, property and event in the librar. It’s a great reference, but many of those pages are a little terse and lacking in examples. And then you have a few of us who are blogging. Writing occasional articles about random parts of FireMonkey. That’s great but a little lacking in coherence, and expecting Google to curate what’s out there isn’t really working out for those new to FMX. I chewed this over and though maybe it was time to sate that desire I’m told we all have in us to write a book. I could create my very own book about FireMonkey. There’s only two downsides to that. Firstly most technical books never make any money for the author and, secondly, when I looked at how much time I had available to write I figured it would take me a couple of years to get finished and by then the technology would have moved on again. Plus, of course, it would be too late to help all those clamouring for help right now. And the increasing numbers who will be learning this stuff when the Mobile versions of Delphi are released. I could change the focus of the blog from in depth techical articles about FireMonkey arcana but again you run into curation problems: blogs simply arean’t a convenient way to learn a technology from start to finish. But the software I use to run this site, Expression Engine, includes a wiki module. I currently use it for the documentation of MonkeyStyler and other downloads. And what is a wiki if not an online book? So I have now started writing what I shall call The FireMonkey Guide, or just The Guide which fits better on the website headers and seems rather fitting for a long time Douglas Adams fan. This will be a work in progress for a very long time, so you’ll have to put up with some gaping holes for a while, but I hope it will become a useful resource for Delphi whether you want to read it from start to finish or odd pages which Google points you to it on a web search. Currently uploaded are the obligatory introduction pages, an Introduction to FireMonkey, TFMXObject and TAnimation and it’s children. TAnimation also comes with a handy Interpolation and AnimationType Illustrated guide with nice pictures of what all those animation types actually do. I hope you’ll find it saves time testing different interpolations to see which does what. At present I’m still finding my way with style and depth of content so please do comment on what you like and don’t like about what I’m writing and the mistakes which, history tells me, will be creeping in along the way. One of the great things about a FireMonkey grid is that each column can contain any control class. The downside is that to do so you need to go to a certain amount of work. If so, read on, you’re in for a fun ride through FireMonkey, generics and RTTI. Here’s our class definition. Really simple. We simply subclass TColumn (which by default gives us a column of TEdits. Sadly there’s not an abstract TGenericColumn class available, which would have been a more appropriate better parent). so the compiler will validate that we get a descendant of TStyledControl when the class is instantiated. Since a grid cell can be any descendant of TStyledControl this verifies we will be using an appropriate component class. CreateCellControl needs to do two things. First it needs to create the control, then it needs to set handlers for any OnChange events of the control so that it can let the grid know when the controls data value changes. 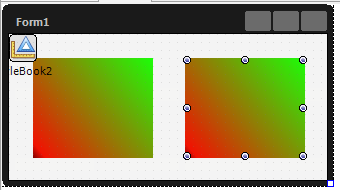 The grid will then fire it’s OnSetValue event so the app can monitor the state of the grid. CreateCellControl can also set any properties of the cell which are needed. Assigning event handlers is a difficult one. We don’t know which class is being created, so we don’t know what it’s OnChange event handler(s) may be called. And there’s no common ancestor with an OnChange property. Instead I created an OnCellCreated event. This is called after creation and enables us to add event handlers and set properties as necessary. Which brings us to the DoChanged event handler. This is where any change events need to be pointed to and it simply calls the DoTextChanged method of TColumn which in turn handles updating the grid. It all works nicely, but that code is not easy to read. And all it’s doing in these examples is setting the OnChange event handler of the cell control. Let’s have another look at setting the event automatically. Whilst we can’t guarantee it, most controls simply have an event named OnChange of type TNotifyEvent which is the only event we need to plug into. So, all we need is to get CreateCellControl to look inside the control for an OnChange event and point it to DoChanged. And this is exactly the type of thing which RTTI was invented for. A TRTTIContext gives us access to RTTI features. It’s a record, so there’s no need to free it. We find the OnChange property. We validate the property is of the correct type. And finally we set the property value for our instance. ‘Simples’ as they say on an advert over here. And the whole thing was achieved in only 58 lines of code! 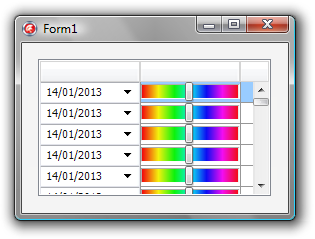 Now it does have the disadvantage that you need to create the columns in code, rather than in the form editor. It would theoretically be possibly to have a string property to specify the class and create the cells from that (another bit of fun advanced Delphi coding) but I could forsee problems with creation order. I.e. The column would be created before the CellClass property was set (or changed) and there would need to be a way to change all the cells already created. I’ll leave that as a challenge for another day. And if you’re interested the rest of the code in the sample app is there to store and retrieve the cell values for the grid’s OnSetValue and OnGetValue events. Which brings to mind an idea to create a grid class which could take any column class and store it’s own values in the same way that a TStringGrid does with strings. Another project for a rainy winters day. Are you the kind of developer who likes to put a hotlink back to your website in the about box of your application? 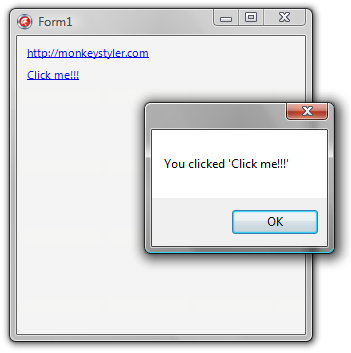 If so, you’ve probably noticed the lack of a clickable URL link component in FireMonkey. Fortunately it isn’t difficult to create one. (Unless you want to do it in XE2, which has a number of gotchas and will be left for another day). I could have done the visual stuff with a custom style but chose to make the changes in code in order to save the need to customise for every style which a developer may use, and also because some changes, such as the need to set HitTest, are easily missed. Here’s the class declaration. We have an AutoOpen property which, if true, will assume the Text property is a URL and open it when clicked. Otherwise you can monitor the OnOpenURL event for clicks. The Create constructor sets the appearance. Note how we have to set the StyledSettings property in order to override what comes from the style. Now we have ApplyStyle which makes changes to the text of the label. Setting HitTest is vital, since otherwise mouse clicks will be ignored and the TText’s OnClick event handler will never fire. If you’re familiar with the TreeView in VCL you’ll probably know that it’s possible to add an image to each item, but that that behaviour isn’t supported out of the box in FireMonkey. So, lets add the support. 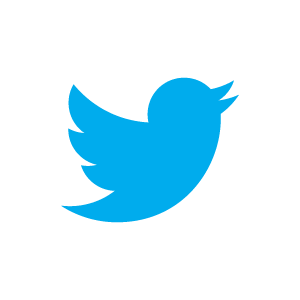 There are a number of ways this could be done, but the simplest is probably by adding a TImage to the style for TTreeViewItem. A TImage contains a TBitmap which has a StyleLookup property. This property is a string which takes the StyleName of another element style element - for another TImage. What we’ll do then is simply add any images to be used to the style, and point the TImage in the style of each TreeViewItem to the one we want to use. Start by copying the style for a TTreeViewItem (TreeViewItemStyle) and call it TreeViewImageItemStyle. 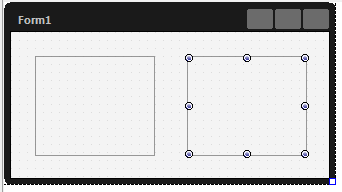 The TImage needs to go in the same TLayout as the checkbox, but we want to add it inside another TLayout - this means the item can be resized while we keep the TImage at the same size. 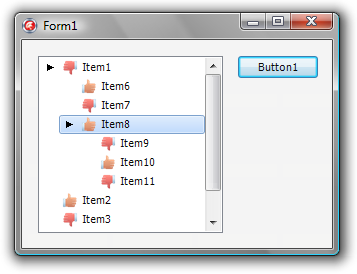 (To copy the style element in the IDE, double click on the TTreeView in the form designer and add an item. Back out, then right click on the item and select Edit Custom Style. Make the changes and click Apply and Close). 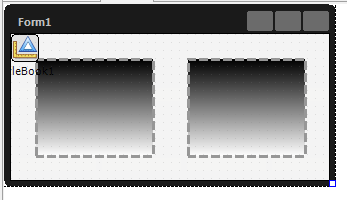 So, add the TLayout and set the properties, Align := alLeft and Width := 20. And add the TImage under it and set the properties, StyleName := ‘image’, Align := alCentre, WrapMode := iwStretch, HitTest := False and Height and Width := 16. The property ImageStyleLookup takes the name of the style element to show as an image. ApplyStyle and FreeStyle are pretty standard, simply fetching or nilling FImage and passing across the ImageStyleLookup. Now we simply need to create something to test it all. Start by adding two images to the style with StyleNames of Image1 and Image2. For my test I’ve use thumbs up and thumbs down graphics. The above is a question which comes up frequently from newbies to FireMonkey. It’s an important question, and answering it opens the door to learning a lot of the power of FireMonkey. The short answer is: In FireMonkey the appearance of a control comes from the style. So, to change the appearance you need to change the style. Let’s look at how to do that in detail. Fire up XE3, start a new project and add two TPanels to the form. Right click on a panel and select Edit Default Style. 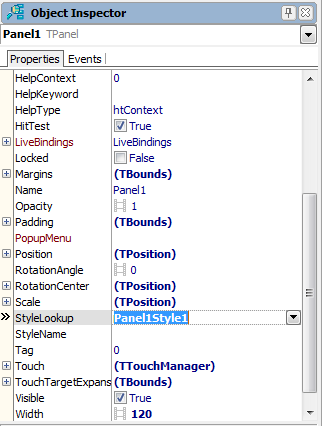 The Structure Pane shows the style for the panel, ‘panelstyle’. Select it to edit it. Now make some edits, in my case I’ve changed the Fill.Kind property to bkGradient and the Stroke.Thickness and Stroke.Dash properties. Click Apply and Close to return to the form. * Added a TStyleBook to the form (StyleBook1). * Set the form’s StyleBook property to StyleBook1. The StyleBook contains the styles which have been modified for this form. In this case we have modified the default style for a TPanel. In other words we have added a style for a panel to the stylebook and this has overridden the default style of the app (note how both panels have changed to the new style). But suppose you only want to change the style for just one or two panels instead of all of them. This time, right click on a panel an select Edit Custom Style. 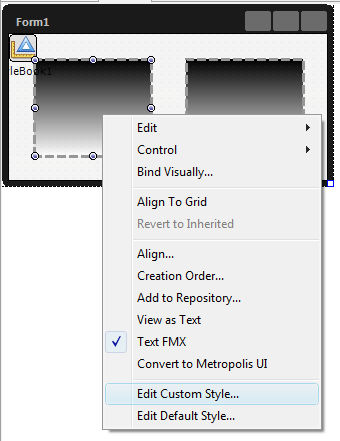 Notice now that the IDE has created a custom style for us, panel1style1. Let’s make some more changes and again click Apply and Close. I’ve now changed the gradient to some funky colors and set the Stroke.Kind to bkNone. Look at the properties for the panel and you’ll note that the StyleLookup is set to Panel1Style1, the name of the custom style the IDE created for us. Changing the StyleLookup property tells FireMonkey to look for a style other than the default one. Now set the StyleLookup for the other panel to Panel1Style1 and you’ll see both panels using the same custom style. You can use the same process to create as many different panel styles as you want, or to change the styles for other classes of controls. Note: If you’re using XE2, some of the property names of the TRectangle will be slightly different, but otherwise everything works the same. MonkeyStyler build 12 is now available. 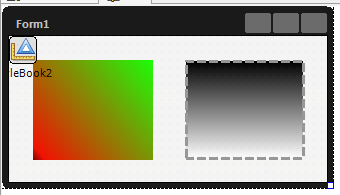 The main change is a new component palette, ver much like you’re used to in Delphi. Search (except in the XE2 edition), select and click on the components tree or control preview to add a new component. You can also use drag and drop. Other improvements are drag and drop support in the components tree and a fix for a bug which caused errors at startup on computers where the regional settings for a decimal separator where not a period (.). Added: Component palette with search and highlighting of search terms. (Note search is unavailable in XE2 due to treeview issues. Added: Select component on Palette and click on Component Tree of Viewer to add it. Fixed: Editing StyleName property caused editor to lose focus. Fixed: Work around for effects not updating in Control Viewer (QC 110506). Added: Drag/drop support to the components tree. Fixed: Errors at start up if decimal separator was a comma in users regional settings.